Load complex assemblies with millions of parts without performance degradation. Over the past decade, the complexity of mechanical CAD designs has continued to grow. Despite the improvements in PC hardware, most CAD systems are incapable of loading large designs – regardless of loading time. The manufacturing industry now relies on visualization solutions to solve this problem reliably and fast. “We at KISTERS are proud to announce that 3DViewStation is not only able to load ultra large assemblies in seconds, but it will also maintain the same impressive speed in functionality before and after the load,” said Kelly Baumann, Business Development Manager for KISTERS North America. “Complex model navigation and selection tools are becoming far more important than classic measurement and section functions,” she added. Known for its modern user-interface, high performance viewing, advanced analysis and integration capabilities into leading systems, 3DViewStation is often installed with current and mature importers for a broad range of 3D and 2D formats including e.g. Catia, NX, Creo, SolidWorks, SolidEdge, Inventor, JT, 3D-PDF, STEP, DWG, DXF, DWF, MS Office and many more. Get the latest 3DViewStation developments in detail at www.3dviewstation.com/blog.html. 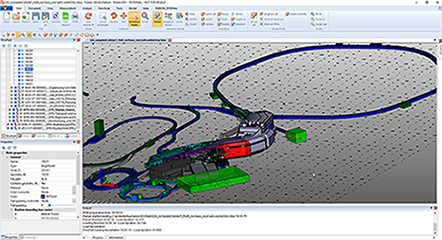 According to Baumann, KISTERS' 3DViewStation is continuously enhanced in response to customer needs and requirements. It's available as Desktop, ActiveX, VR-Edition and HTML5 WebViewer products. Note: All versions are intended to be used with a PLM, ERP or other management system product configuration or service and spare part applications, providing all necessary APIs. A HTML5-based WebViewer solution available, which does not require client installation. All file formats can be used in combination with the intelligent navigation and hyperlinking features to address needs of complex integration scenarios.